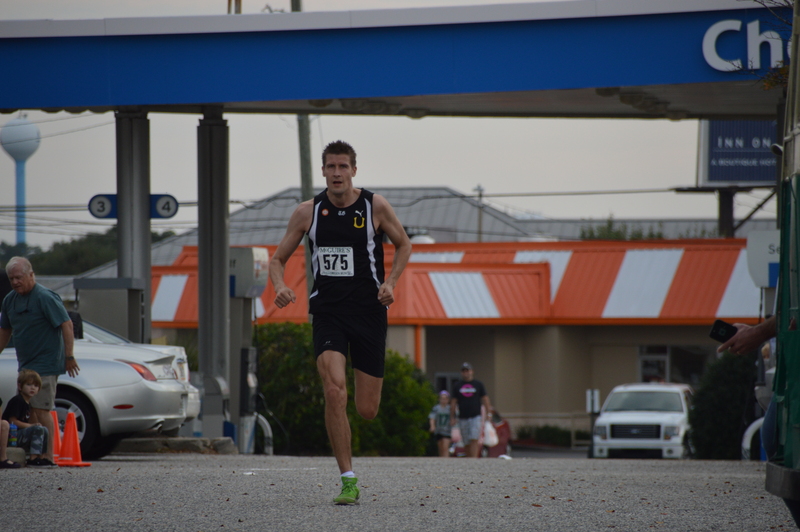 The skies were overcast and temperatures warm and humid for the 19th Annual McGuire’s Irish Pub 2015 Halloween 5K and 10K held on Halloween, Saturday October 31, 2015 as 41 year old Jukka Kero from Turku, Finland took first place of the 5K with a 5:39 average pace in 17:31. Crystal Greenlund of Niceville, Florida was first female in 21:09. Simone Faroni of Destin takes the Female Masters award in 23:50 and Robert Clark of Niceville, Florida wins Male Masters in 19:41. Grand Master Female goes to Susan Newkirk of Gulf Breeze, Florida in 25:29 and Male Grand Masters goes to Felix Paulino of Mary Esther, Florida in 20:54. Dale Griffin 35 of Brandon, MS was first male of the 10K in 36:23 and Andreina Kero 37 of Turku, Finland was the top female in the 10 K in 40:00 even. Chris Neal 62 of Milton, Florida won Masters title in 39:33, Female Masters winner Kristen Corderman of Nicevile, Florida ran 10K in 47:25, while Joe Corderman of Niceville, Florida won Grand Masters in 40:07. Karen Meadows of Panama City Beach won Female Grand Masters in 49:47.